The Ramones are punk pioneers in the way that Chuck Berry is a pioneer of rock and roll. That is to say that there is no punk rock without The Ramones. Easily identifiable by their loud hair, leather jackets, and Chuck Taylors, their most famous hit is most assuredly “Blitzkrieg Bop”, or as it is more commonly known “Hey Ho! Let’s Go!”. It’s been used in hundreds of commercials, TV shows, movies, and at sporting events around the world since its release back in 1976. It was The Ramones debut single in the US and solidified them as a musical force to be reckoned with. The music video is a recording of a live performance of theirs. 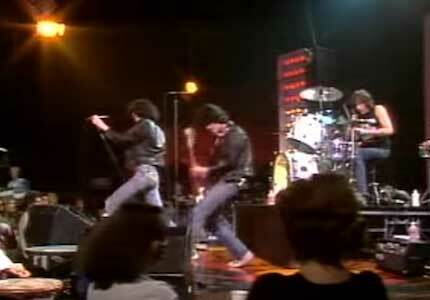 It features the original lineup of Joey, Johnny, Tommy, and Dee Dee Ramone playing the song in front of a banner that features their famous logo. The band plays the song with such energy that you can’t help but chanting along on the chorus. It’s no wonder the track has become such a staple in the sports world. The melody is also incredibly catchy and recognizable. And while the pace is very fast and non-stop, it’s not overpowering, allowing the listener to follow along easily. The Ramones are known for having worn Chuck Taylors frequently throughout their history. It set the trend in punk music footwear-wise as we would see punk bands throughout the 1980’s, 90’s, and 2000’s wear chucks. 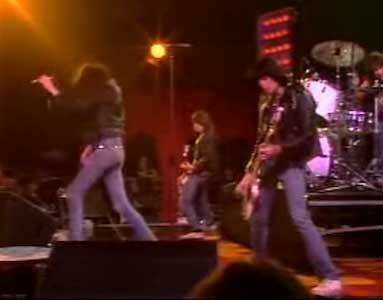 In this performance, the Ramones are all wearing all white low top chucks, except for Tommy Ramone on drums, who appears to be wearing a pair of gray chucks. “Blitzkrieg Bop” is not only one of the most recognizable songs in punk rock, but it is one of the most recognizable songs in all of music, and that makes the Ramones easily one of the greatest bands of all time. 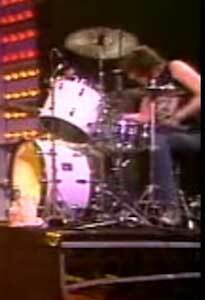 Tommy Ramone drumming in a pair of gray chucks.